In memory of the war hero Lieutenant Raymond Enners, Ray Enners was a lacrosse player at Half Hollow Hills High School back in the 1960’s. Apart of the 1963 All-Long Island Lacrosse Team, Enners was inducted into the Suffolk County Hall of Fame in 2004. In college, he played for the United States Military Academy, Army West Point, and was an All American in his senior season. Graduating in 1967, he was drafted to the Vietnam War. Lt. Enners laid down his life for this beautiful country. He made the ultimate sacrifice, so that we can all enjoy, play and coach this great game we all love. Since 1970, one year after Lt. Enners’ death, the Suffolk County Boys Lacrosse Coaches Association has been honoring Lt. Ray Enners character, and skill by giving out the prestigious Lt. Ray Enners award to a senior in Suffolk who best exemplifies Ray Enners and all he stood for. However talent alone does not win this award. 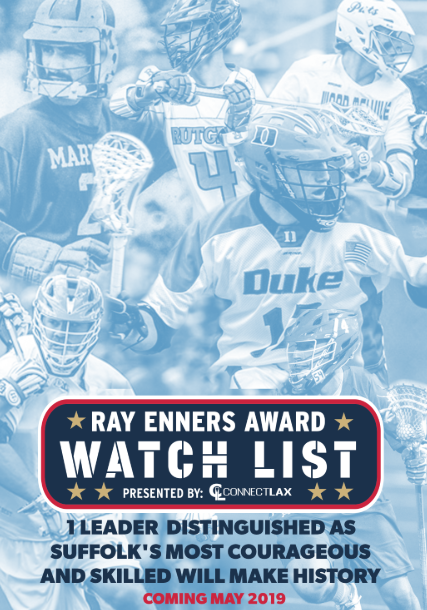 Not only does the player who receives this award have great lacrosse ability, but he must also be an incredible person; A true example of Lt. Ray Enners. Matt Cannon, Mid/FO, Northport, securing possessions for the Tigers with technique and skill. A key cog in Northport’s machine. Karl Lacalandra, Defense, Comsewogue: Tough as nails. A Pete Mitchell product, knows the game, plays hard, don’t cross the middle around Laca. Michael Huff, Midfield, ESM/ NYIT: an grinder, Huff makes contributions when it counts, and has the abiltiy to play on both ends of the field. Thomas Sangiovanni, Midfield, Harborfield/ Siena: Shifty, the Italian Stallion is quick out the gate and has the ability to get to his strength and let it rip. 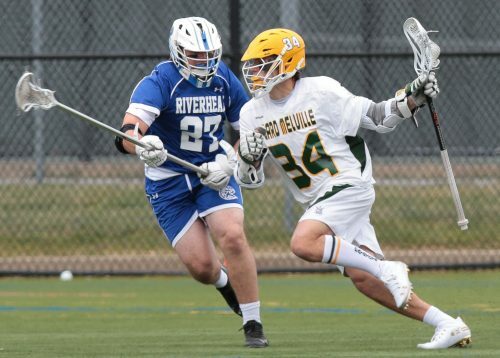 Connor Kalmus, Midfield, Riverhead/ St. Johns: A stretch shooter, Kalmus has the ability to throw the hitch and pull up from 17, low to high, he lets it rip. Christian Lowd, LSM, Smithtown West/ Stony Brook: Rangy, Lowd loves to throw checks and push in transition. Matt Caddigan, Midfield, Smithtown West/ UMass, talk about an athlete. Kid has grown into a young man in his Senior year. Could be a big piece in West’s County Championship hopes. Marc Cottage Jr. Attack, Smithtown West: Confident with the ball, Cottage is patient with his defenders, waiting for the opportunity to present itself, hes has the ability to expose defenses with the alley dodges and sweeps to the middle. Dominic Boscarino, Midfield, Mt. Sinai: Speedy, two-way midfielder. Senior leader for the Stangs, #1 ranked team on the island right now. Bobby DeMeo, Attack, Mt. Sinai/ Cornell: Quick and shifty, DeMeo is a threat from the perimeter, having the ability to dodge and score as well as dish for the assist. Kid likes to score Gs. Bailey Kolovich, Midfield, Mt. Sinai: Break-away speed, great COD, great in open field. Devin Degennaro, Goalie, Islip/ Wagner: Quick hands, Degennaro tracts the ball extremely well and is not afraid to put it on a rope in the clearing game. T.J. Heyder, Attack, Comsewogue/ Mercy: An attackman that does not give up in the riding game, Heyder causes havoc and gets the ball back for his team. He is also very sneaky in and around the goaline. Sean Kennedy, Midfield, Comsewogue/ LIU Post: A outside stretch shooter, Kennedy is known to find time and room, poses extreme threat for teams off ball. Michael Alexander, Defense, West Islip/ Yale: Leader of the Lions Defense, Alexander is a quarterback out on the field. A lock down defenseman, Alexander brings a strong build and solid fundamentals to the table. Blake Behlen, Attack, Commack/ Towson: Gritty attackman knows how to put up numbers and get the job done for his team. Will Button, Attack, Bay Shore/Stony Brook: Leader of Bay Shores offense, Scully can take control and put up big numbers. Conor Calderone, FO, Smithtown West/ Maryland: Calderone is an absolute beast, winning to GB to himself, he possesses solid stick work that allow him to be a threat in the offensive end. Frank Ciniglio, Defense, Ward Melville/ Cornell: Extreme drive and passion for the game as well as his team, Ciniglio is a fighter, giving him the mindset to guard anyone. Vince D’Alto, Attack, Kings Park/ Stony Brook: A guy who creates for himself, the lefty shooter is dynamic, able to get to 5n5 and send it home. Terrance Day, Midfield, Bay Shore/ Stony Brook: Quarterback and Cornerback on the football squad, the slick midfielder brings a two way midfielder mentality at Bay Shore. Kevin Ehli, Defense, Smithtown West/ Utah: A workhorse, Ehli’s drive to be better and lead his team is second to none. The kid is tough and is not afraid to unleash the beast on any opposing attackman. Gerald Filardi Jr, Defense, Hills West/ Penn State: Phenomenal athlete, Filardi is an emotional leader, giving it everything he has on every single play. Chris Giuliani, Attack, Islip/: A guy who is not afraid to take it to the rack, Giuliani will look to run Islips offense this season. Nick Grant, Defense, Commack/ LIU Post: A presence in the clearing game and pushing in transition, Grant’s tenacity is what makes him a player to watch, having good skills off the carpet. John Hoffman, Attack, Smithtown West/ Providence: The lefty assassin, Hoffman is so lethal, possessing the ability to work offball, create for himself and sting one top shelf where momma hides the cookies. Ryan Huff, LSM, Eastport-South Manor/ Army Prep: Tough, grinder and leader of the rope unit, Knote is all over the GBs and is never afraid to chase down opposing talent and push transition. AJ Kiernan, FO, Sachem East/ High Point: Kiernan is a scrapper the X. He does not give up on the GB battle and will continue to fight until his team can push in transition or secures possession. Matt Knote, Goalie, Eastport-South Manor/ UMass: Big time righty stopper, Knote is the backbone of the ESM Defense. Christian Michaels, Goalie, Kings Park/ UMBC: Michaels has a lot of experience between the pipes and his personality shows it. Michaels stands tall on every shot and looks very confident when its 1v1 on the doorstep. Christian Mule, Attack, Hills West/ Duke: Dynamic, Mule can dodge, feed and score. He has a lefty cannon and will be a vital role in West’s offense this season. Max Napoli, Midfield, Northport/ Stony Brook: Ground ball machine, Napoli is not afraid to get down and dirty, bringing back those old school grassy knuckles. Tyler Nolan, Attack, Westhampton Beach/ Jacksonville: Nolan aggressively gets down hill and lights it up. When the kid scores you see he always is looking for a teammate to get up with. Pat Oneill, Defense, Ward Melville/ Brown: Lock down defenseman, Oneill is an animal. Uncaged, attackman must be aware as his footwork and defensive principles are fundamentally sound. Dylan Pallonetti, Attack, Ward Melville/ Maryland: Strong build, Pallonetti has quick feet allowing him to put extreme pressures on defenses from the left side, and if his hands are free within 15, he’s letting it fly. Dylan Pape, FO, West Islip/ Siena: Speedy, Pape gets the ball out quick. The kid has dangles, allowing him to get to the outside and push transition. Sal Pascarella, LSM, Hills East/ St. Joseph’s PA: Grider type LSM, Pascarella wreaks havoc between the lines, causing turnovers, scooping up GBs and pushing in transition. Jared Paquette, Goalie, West Islip/ Yale: The 6’ monster he’s the ability to make stops and outlet the ball to his teammates with force. Vocal, Paquette is a leader out there. James Ringer, Midfield, Bayport Blue Point/ Rutgers: Absolute workhorse, Ringer has phenomenal work ethic and great character. 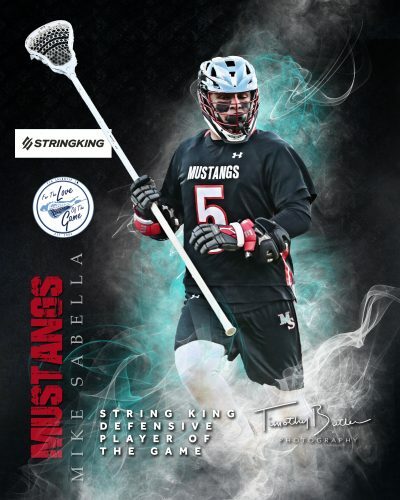 Michael Sabella, Defense, Mount Sinai/ Stony Brook: An absolute animal, Sabella in a old school type guy who locks it down, plays hard on every whistle, and gets up for his teammates. Rob Saragga, Attack, Bay Shore: Attackman from Bay Shore who had a breakout season during his junior campaign is looking to have another promising season. John Sidorski, Attack, East Islip/ Lehigh: Big Time Lefty Shooter, Sidorski is great off the dodge and creating space for himself in time and room. Jack Stewart, Midfield, Huntington/ Air Force: Do it all type guy, Stewart brings a mentality on the field that every play is as important as the last. Justin Tiernan, Attack, John Glenn/ Lehigh: Bigtime righty attack, gets creative with his game including multiple BTB’s, Tiernan is not afraid of anyone in any situation. Tommy Heller, Goalie, Comsewogue/ Albany: Stone wall, Heller stands tall in the net and is not afraid to get acrobatic. He is exceptional in the clearing game.